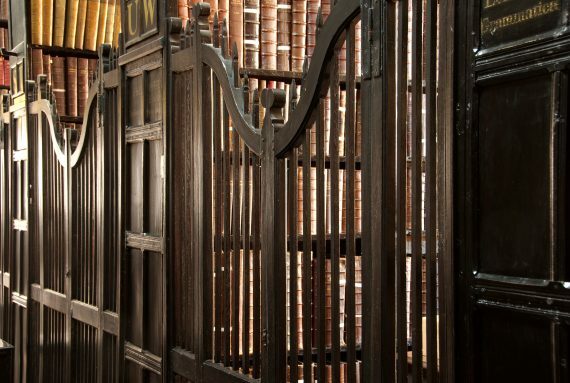 We are delighted to have been awarded a grant of £25,500 from the DCMS Wolfson Museums and Galleries Improvement Fund for our project ‘Opening Up Chetham’s Library’. The Museums and Galleries Improvement Fund was established in partnership with the Department for Digital, Culture, Media and Sport (DCMS) in 2000 to improve the quality of displays, exhibition spaces, collection interpretation and disabled access in museums and galleries across England. Chetham’s Library is one of 35 museums and galleries across the country to receive grants in January 2019. We’re also very grateful to the 29th May 1961 Charitable Trust, who have kindly provided the funding to match with the DCMS/Wolfson grant to extend the impact of the projects and enable us to achieve more still. Our grant will enable us to do three exciting new things. The bookshelves in the library are arranged as pictured here, with access restricted to each alcove (called a ‘press’) by a wooden gate with a lock. With some new measures in place to protect the books, we’ll be opening one of the presses – you will be able to go into the press, enjoy the greater sense of being ‘inside’ the library and see it from the librarian’s perspective, in a way that hasn’t been possible since 1740. Many of the library’s most important and most beautiful treasures are too delicate to be handled often, but facsimiles can provide visitors with an experience as close as possible to handling the real thing. As well as seeing the historic books on the shelves, the facsimiles will enable you to turn the pages of some of the library’s most precious books for the first time. Installing new UV protective blinds might sound like the sort of thing that only a rare books librarian would get excited about… But stick with us! Since the demolition of the Palatine Building on Victoria Street, the light levels in the main areas of the library have greatly increased. This has a detrimental effect on very old books that were never previously exposed to direct sunlight. New blinds will protect the books from any further damage, as well as reducing the glare at certain times of day that can make it difficult to see the library’s beautiful (but naturally dark) interior. I would love to use your library for reading and research. Are there any available facilities?